Note: Dave's reminders are left in to shame him for promising to write a trip report and failing to deliver. Amidst chaos and terror on Saturday morning I managed to steal away with the 3 finest cavers I could find. Or the first ones I found. With prepacked bags we skipped off towards Little Hull without a care for earthly things such as the code to get into the hut, or where Perry was going to put DKPs car keys, or why Perry had DKPs car keys. The walk to Little Hull is fairly long but mostly gentle and along a nice track. After 40 minutes on this track you pass a gate and reach a 4 way crossroad and the way on is to go at a 45 degree angle from the left wall. Over the brow of a hill it is possible to see the shallow depression in which lies Little Hull, just a minutes further walk. The entrance is a small, dark slip into a crawl. I led, with the first bag skipping and bouncing on the cobbles behind me. Dogged by Mr Jack I set a quick pace and we were very quickly at the head of the first pitch. I had some in-situ rope to follow which I imagined saved some time as it meant it was obvious to step into a window immediately on the first hang. A small traverse brought me to the final hang. At the bottom I waited for Ben, bringing up the rear and therefore of course having the second bag of rope. Ben volunteered to rig the next pitch. A longish traverse leads to an easy squeeze and out onto a crows nest ledge looking out on the final hang, void on both sides. It was all the more nest like for the 50m of abandoned in situ rope haphazardly flaked on the floor. Very comfy. We settled in and Ben rigged. The hang is off two bolts quite a reach away on the far wall. I was second down and had to do a terrifying maneouver where I had to lean on my head on the far wall in order to free both my hands to rig my descender. Still it was done and done I went. At the bottom we waited for a while before DKP appeared. And then a longer while until Mr Jack said he was not happy with passing the rigging. I sent Ben and DKP ahead to rig the final pitch and bounced (literally) up the rope. At the top I rerigged so that the previously tight traverse line was abseilable and got Jack's seal of approval. Back at the bottom we hurried to catch up with Ben and DKP. We opted for the duck rather than faff about with the tight squeeze bypass (it is entirely possible to keep your torso dry in the duck). We caught the other two as DKP was climbing a random rope into the ceiling. I told him to come down. On close inspection that rope appears to be tied around a single rock and its not obvious what its for. We continued down the stream, squeezing, climbing and crawling until we reached a pitch. A single spit in the wall taunted us. We looked around for a while but failed to find any p bolts (apparently there's a chimney climb shortly after the fixed rope that leads to a traverse). I started rigging on some naturals but as I finished wrapping a sling around a rock that was wedged in the streambed I thought better of it and decided we'd had enough fun for one day. The way out felt fairly quick. Ben derigged the bottom pitch and Jack the top. We sang the new song I learned 'Rattling Bog' for a bit. Exiting into daylight was a rare pleasure and we followed out footprints home. This is the first of hopefully many publications from the Diligent Officers of Grim and Grimey Exploratory Reconnaissance and Surveying. In our reports we hope to expose a large audience to our thorough explorations of the more obscure crevices that the underworld has to offer. The illustrious chairman had uncovered reports of a location that had not been pushed to it's fullest potential. A thorough search of online material revealed that the latest known explorations had halted at the last of three sumps/ducks but that there was a further potential for 2km of horizontal and 60m vertical development. With the hope that perhaps the water could be persuaded to lower, or that some alternative route be found, our chairman organised this first trip. Our main aims were to locate the cave and further the route to the main drag within. Upon our arrival at REDACTED Tubs we found a steep beautiful snow covered valley. Streams sprung from several holes in the side. We changed by the side of the Butter REDACTED. Our surface team helped Alex and myself into our suits, and apparatus. Once suitably clothed we followed rabbit tracks down the steep slope to the bottom of the valley. The site of our cave was fairly obvious. A large limestone outcrop with a stream resurging below. We examined the limestone face for entrances and found a couple. Alex picked one and we began our descent. A loose and obviously dug climb down leads immediately to a small collapsed chamber. A flat out crawl across the top of a large boulder led via a climb down into the streamway. We explored quite a few ways on. The immediate dry ways on die. Following the largest stream upstream there is a stoop under some shelves. Beyond, following the water finds a sump and above the sump a passage leads to horrific gloopy mud crawls that threatens to stick us permanently in place. The correct way on is a climb on the left (looking upstream) just after the shelves. 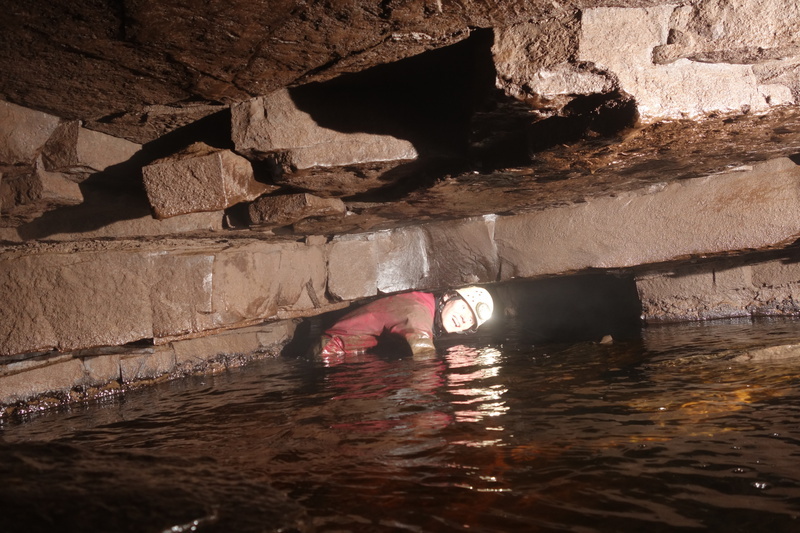 A tight hands and knees crawl in mud leads past a small drippy aven and then drops into a large collapse chamber, with the stream running at the bottom. Climbing down to the left it is possible to go left and right. Left leads into a walking passage that almost immediately sumps. Right, squeezing past a boulder, goes into walking passage. We followed the obvious passage and climbed over some pools into a crawl. The crawl led quickly to the streamway again. The cave is marvellous beyond this point. The streamway quickly opens out to walking size and goes for some way. One section has huge teeth of rock jutting straight down into the passage but it is possible to zig zag around them and avoid the need even to stoop for the most part. The streambed is covered with a deep silt that makes walking tricky and in many places there is evidence of flooding to the roof. Once or twice there are large blocks, fallen from the ceiling, that must be scrambled over or squeezed past. After a while the passage closes down and there is a junction. To the right the passage lowers to a grim looking duck. To the left the passage lowers and you pass the other side of the grim looking duck. Continuing the passage lowers to a crawl. There is a small dry flat out crawl on the left. Wiggling through this brought us to a chamber of impressive dimensions, with a small cascade over fallen rocks and boulders in the middle. Continuing upstream we are rewarded with more fine streamway. All too soon this lowers and the stream disappears under a floor of rocks and pebbles. We find a chamber formed of fallen blocks from the ceiling that have often left almost perfectly shaped sockets in the ceiling. The cracks running across the dark rock warn of the next ceiling block to fall. A flat out crawl continues. It would be hands and knees if not for our reluctance to scrape the ceiling. Too long after we rejoing the stream. Stooping passage brings us to the first of three ducks. We (mostly I) decide this is our turn around point for today. Alex decides to examine the duck more closely first though and wades in. He emerges manic and eager to continue moving. We make our way out. There is perhaps only 40 minutes of mostly pleasant caving to the exit from this first duck. We emerge to daylight. I attempt to clean my oversuit on the snow, with some success. Our surface team welcomes us back. Return, and pass the ducks. Neoprene highly recommended. I’d been hoping to pay a visit to CFC since reading about it over Christmas in the MSG journals. Being somewhat out of the way I wasn’t expecting to have a chance to visit any time soon. Fortunately Sunday presented itself as the perfect opportunity. Interest in caving was lacking, with several members opting to do an easier trip to the Crown instead. The rest of the club was rounded up by the Jackhal, who was intent on caving no matter what. This left DKP free to drive a small team to CFC to have a poke around. The team was composed of myself, Rhys, Diss and DKP (in order of keenness) and were christened by Rhys as the ‘Diligent Officers of Grim and Grimey Exploratory Reconnaissance and Surveying’. With no rope to pack we were soon on our way. The CPC is closer to the cave than most other huts, but it’s still a 40 minute drive away. This turned out to be quite a picturesque journey, passing the Ribblehead viaduct and then heading across the fells towards Hawes. As we ascended the sky filled with dark clouds and it began to snow, though as soon as we entered the valley the snow cleared and by the time we had reached our destination there was glorious sunshine. The cave is at the head of a valley next to the buttertubs, a series of surprisingly deep potholes, and would be difficult to spot if it weren’t for the three streams gushing out of an otherwise unassuming scree slope. On arriving, DKP and Diss decided that it was far too cold to go caving and that they would bravely wait it out in the car. This left Rhys and I to tackle the cave. After crunching our way through the snow, navigating our way around the various large holes in the ground and crossing the (very steep!) valley we arrived at the spring. Poking around higher up the scree slope we found a couple of possible entrances - one leading off horizontally and the other descending rapidly. Opting for the latter Rhys volunteered me to give it a go, so I inserted myself and had a look around. Fortunately this turned out to be the correct entrance and I soon dropped into a small section of passage with three possible ways on. The left hand route looked tight but relatively dry, ahead was an extremely muddy passage while on the right the stream could be seen flowing towards us into a pile of rocks. We first had a look at the right passage, and discovered that the stream began to get quite deep ahead. I noticed an unpleasant looking crawl leading off high up to the left and disappearing around a tight bend. “looks grim” I said, “I wouldn’t want to go down there!”. So we turned back and looked in turn at the other passages leading from the T-junction. The muddy one looked unbearably grim. The left hand route had clearly been dug and had bits of det cord lying around - presumably this was the NPC’s unsuccessful dig from the ‘60s. “Let’s have another look at that grim crawl you saw” said Rhys. He opted to do it first, with me following a short while afterwards. In reality it wasn’t so bad, despite the rather intimidating 90° bend at the start. After some grovelling I found Rhys waiting patiently for me in a nicely sized chamber. “I guess this must be the right way then”. Rhys nodded. “I guess I’d better go back and get the bag then”. Rhys nodded. After the crawl the route dropped into nicer passage. There seemed to be two levels to it, a higher one presumably active only in flood and ominous sump pools a meter down which beckoned into depths where the stream surely flowed. We negotiated our way along the upper levels until we reached flowing water and dropped into the streamway. Given the experience we’d had with the entrance series this was surprisingly nice cave - a wide walking streamway. The passage shape was quite different from other streamways, with a flat floor and large tooth-shaped protrusions hanging from the ceiling and dangling a foot from the floor in places. We splashed along. On a more grim note we saw bits of foam in places we wished we hadn’t - half way up walls or tucked into alcoves in the ceiling. Clearly not a good place to be on a wet day. From what I remembered of the survey I knew we’d come across a large chamber at some point, but wasn’t entirely sure what would count as ‘large’. After a while we came to a point where the passage lowered and appeared to turn into a grim flat out crawl through the stream. On the left a very tight but dry passage lead off, so as a last resort I opted to try that rather than the aqueous route. I hadn’t been mistaken about how narrow it was! Fortunately after a little while squirming through the sand I popped out into Fault Hall. This was a respectably sized chamber which has clearly developed along a prominent fault running roughly perpendicular to the passage. Rhys seemed fairly pleased with this and was keen on photos, but decided we’d do that on the way out. I pointed out a hanger in a corner of the ceiling with a corresponding passage leading off into the Spar Shop series; unfortunately there didn’t seem to be an obvious way up without climbing gear. On the opposite side of the chamber the stream poured out of the continuing passage down a small cascade. We climbed up and began to follow it again. The character of the streamway past Fault Hall was notably different from what we’d encountered so far. The ceiling was flat and thin horizontal blades of rock emerged from the wall on either side. Both these and the ceiling had deposits of brown/red dried mud that clearly hadn’t been disturbed for a very long time. Presumably this part of the cave doesn’t flood, though I’m quite happy to leave that hypothesis untested. The passage went almost dead straight, again seeming to have developed along faults. We began to come across big flat blocks littering the streamway and there was little doubt as to where they’d come from. Abruptly the passage began to lower and we reached a dead end. Or not quite - it was a pretty unpleasant looking duck. Not being prepared to do something quite so grim just yet we backtracked a bit and found a passage leading off to the left that fortunately bypassed it. Progressing further the number of big flat blocks littering the passage increased. The ceiling lowered, forcing us into a crawl, and the passage widened as we entered the ominously named “Room of Dangling Doom”. According to the MSG journals the ceiling here is shale and limits the development of the cave to the limestone below. The aforementioned room is filled with large flat blocks of the stuff, which are clearly distinct from the limestone by the strange almost metallic black sheen to them. Large cracks are visible in the ceiling which sags noticeably towards a large crack above the middle of the chamber. We tried not to think too much about this and moved on as quickly as we could while simultaneously trying not to disturb anything. The crawl leading out of the RODD was rather unpleasant. At one point I saw a worm wriggle into the mud next to a block of shale and I had a moment of empathy with its bleak existence. Fortunately there wasn’t too much left and we were soon at sump 1. Or not quite a sump. Despite being furnished with a twine dive line there was also a welcoming 20cm of airspace. Thinking only of making progress I was eager to immerse myself and, after waiting for Rhys to set up his photography gear, headed on in. After a few metres of stooping the floor sloped downwards and I was soon standing upright, neck deep in the icy water. As the cold shock kicked in I began hyperventilating and turned to leave. No, this could still work, calm down Alex. With my breathing somewhat back under control I turned again to continue onwards and inched forwards. My head was pressed into the ceiling at an angle such that I could simultaneously breathe and see ahead. Slowly, I tried to make progress. I could feel boulders on the floor with my feet and the dive line trying to wind its way around my legs. The water level was just below my mouth and with every movement I risked tripping over and getting a mouthful of it. I came to my senses - this was really stupid. I had no clue how long the duck was, the water was extremely cold and I was clad in a furry and fabric oversuit. What was I doing in there?? Feeling disappointed and foolish I slowly retreated and headed back to Rhys. By this stage I was quite cold and could tell I’d get colder if we hung around so suggested we head out swiftly. On our way out we paused in the streamway and then at Fault Hall so that Rhys could take some photos. He was thankfully quick at this and managed to take some impressive shots. We were soon again on our way and in no time reached the entrance to the cave and the warmth of DKP’s car. Despite the disappointment at the end, the trip was thoroughly enjoyable. It would make a sporting Sunday trip if it weren’t for the distance from our usual haunts.